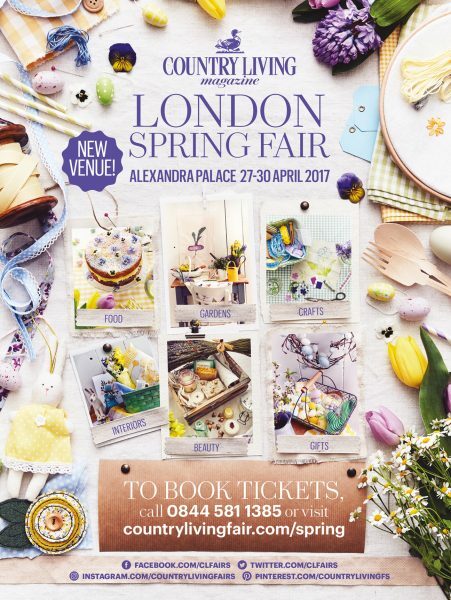 You could win tickets to the Country Living Fair, from 27th-30th April at Alexandra Palace, London. We’re giving away four pairs of tickets, worth £36 a pair. Even if you don’t win, there’s Middlesized Garden reader discount. Tickets cost £18 on the door – you can get yours for £13.50 using the code TR3 when buying your ticket here. The Country Living Fair is a great place to find crafts, artisan made foods, organic wines, fashion, accessories and gorgeous things for your home and garden. The famous Country Living Fair has moved to Alexandra Palace. It’s a fab show for craftsmanship and new businesses – I’ll be making a beeline for the Pop-up Market for crafters, makers, designers and artists who create their products at home. Don’t miss sampling the goodies of the kitchen table bakers, chocolatiers, organic wine producers and traditional farmers. And, of course, there’s the Country Living Garden, designed by Horticolous. Plus there are lots of gorgeous things to get for your summer garden, as well fashion, accessories and homes products. Do drop in on my friend Jacqui Sinnatt, who runs St Agnes Eve silk scarves. She’s on stand H29 -very near the Drunken Duck Champagne Bar! 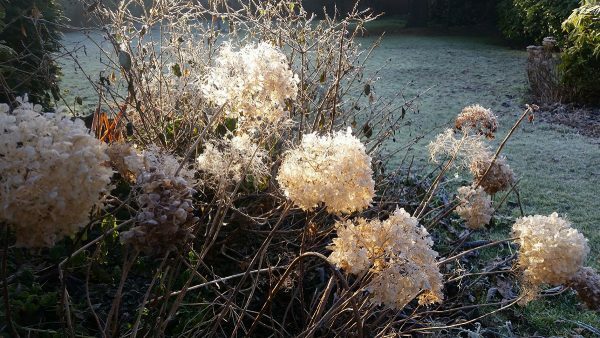 Jacqui’s photos of winter hydrangeas in her garden. 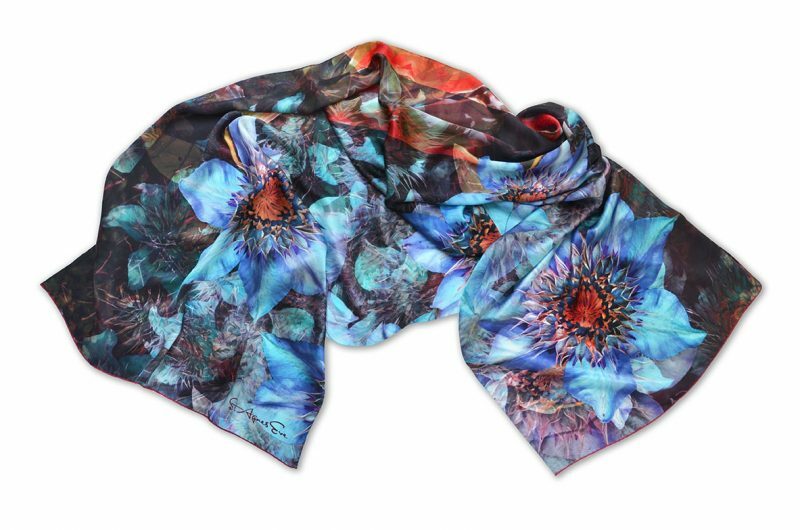 She’s a designer and photographer, who has turned photographs of her favourite flowers, gardens and other things into beautiful silk scarves and accessories. 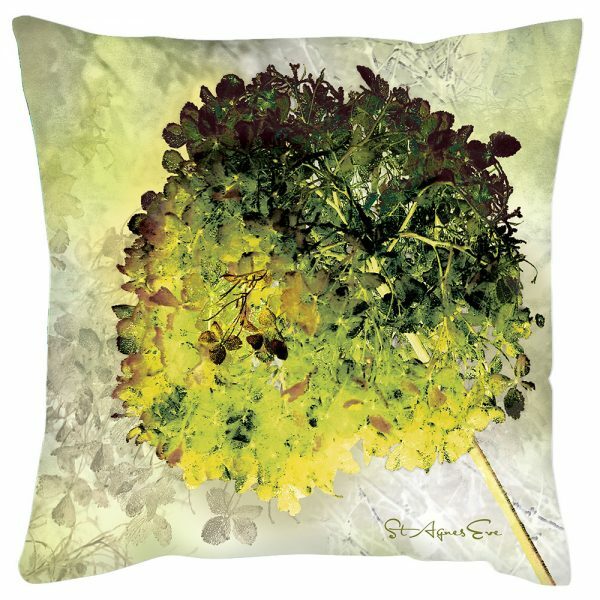 One of Jacqui’s new ‘Annabelle’ cushions, inspired by the winter hydrangea photo. Many of Jacqui’s designs are based on flowers in her own garden or on gardens she’s visited. Although she’s turned thrownaway cans on Dungeness beach and jumbo jets in the sky over London into scarves, too. 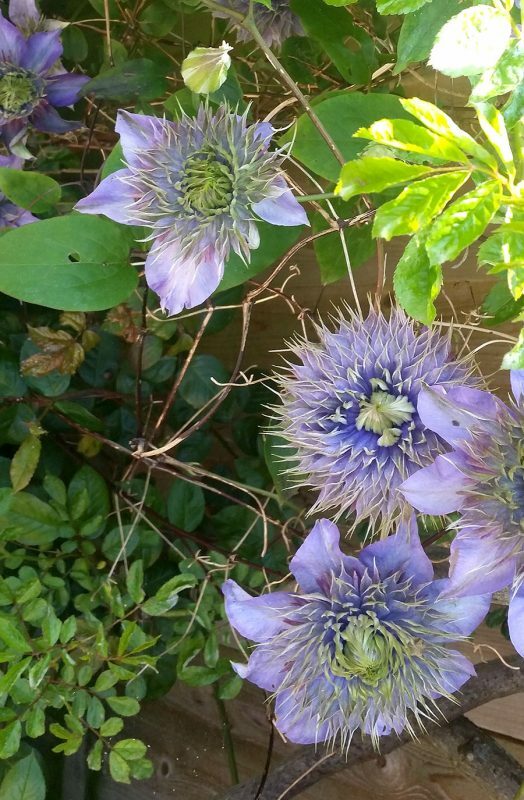 Clematis ‘Morning Glory’ photographed by Jacqui in her garden. And the scarf inspired by Jacqui’s clematis – see it on stand H29. This year she’s launching her Annabelle cushion collection, inspired by gardens. A scarf inspired by your own garden? I think one of her best ideas is her bespoke scarves, an ideal ‘big present’ for someone. This is a scarf specifically designed to reflect the things that are important to you. One client ordered one for his mother’s 90th birthday present. It’s based on olive trees but also features her beloved poodle Poupou! The scarf is presented in a gift box with a card telling the story and inspiration behind the design. Contact St Agnes Eve direct if you want to find out how much bespoke scarves cost. There’s also a programme of workshops and talks – working with chocolate, printing, sewing and needle-felting as well as an Annie Sloan Chalk Paints workshop. To win a pair of tickets to the Country Living Spring Fair, worth £36, leave a comment below saying why you would like to go to the fair. Or share this post on social media via Twitter, using the share button at the top or bottom of this page. Or, if you’re reading this from The Middlesized Garden Facebook page, then you can enter by simply ‘like’ing the post. Competition ends Thursday 20th April at midnight, and winners will be notified on Friday. See full terms and conditions below. And don’t forget that there’s a discount for everyone – get your tickets (worth £18 each on the door) here for £13.50 using the code TR3. Look out for more giveaways and discounts on Wednesdays in the summer! The winners were Jill Forrest, Leanna Cleaver, Alison Oubridge and Ida Chan. Terms & Conditions: This prize draw is open to residents of the United Kingdom. Relatives of employees of Country Living and the Middlesized Garden or anyone connected with this prize draw are not permitted to enter. There is no entry fee and no purchase is necessary. The prize draw closes at midnight on Thursday 20th April 2017. The winner/s will be chosen at random and notified by either Twitter or email within 48 hours of the closing date. If the winner doesn’t respond to claim the prize within five days of being notified, another winner may be appointed. There is no cash alternative to the prize. Prizes are not transferrable. Any email addresses provided to enter this prize draw will be used in accordance with UK Data legislation. The names of the winners as provided in your tweet or comment will normally be published on the Middlesized Garden. The Middlesized Garden is not responsible for inaccurate prize details supplied by any third party involved with this prize draw and reserves the right to cancel this prize draw in the event of unforeseen circumstances. 8 comments on "Win tickets to the Country Living Fair + discount!" I go for inspiration..The Craft tables and the artisan foods! I need new inspiration for autumn flowers, garden seating and my new rockery. Tickets to Country Living Spring Fair would be perfect for ideas and give me the kick start into action. I would love to go to the show as I’ve just purchased my first country home with my fiancée. We are both so excited to make it into our dream forever home. 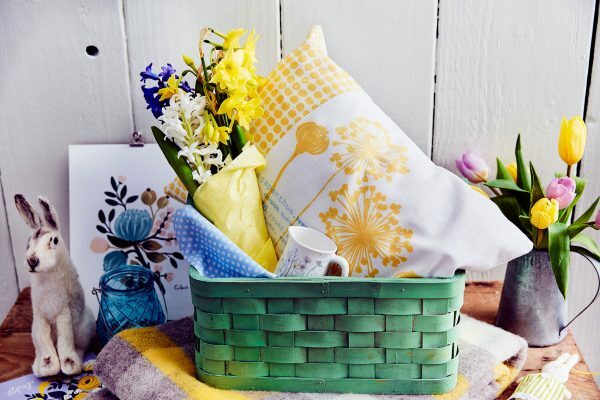 I would love to win this prize and take my garden fanatic mum who could do with some good news!